An interesting Nature paper from deCODE researchers. I find the result stated in the Times coverage of the article a bit shocking. (I haven't read the paper carefully enough to know whether this is an accurate summary.) 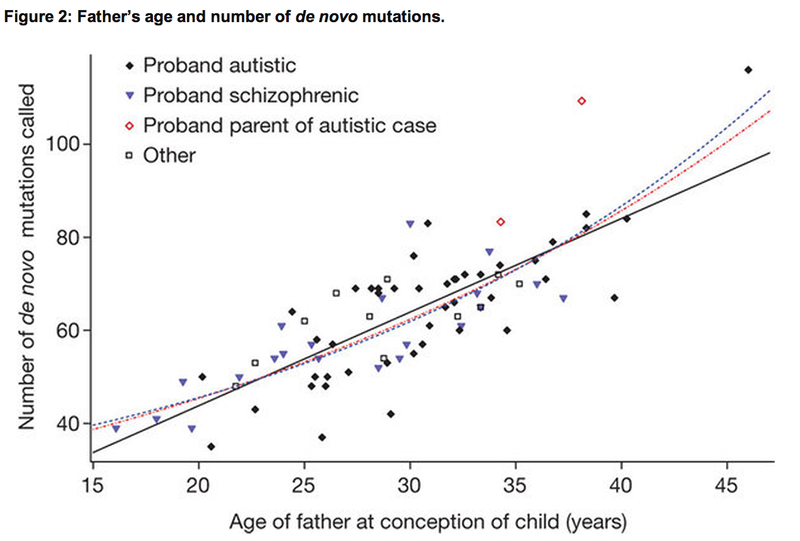 If these de novo mutations are responsible for a big chunk of the increased autism risk in children of older fathers, then it would be the case that of order 100 additional mutations increases the probability of autism by about 1 percent. But this would imply that about 1 in 10k mutations are in an area strongly affecting brain development, specifically autism risk. For example, over 100k loci (out of 3 billion in the whole genome) have a large (i.e., increasing the probability to close to unity) effect on autism risk, or a much much larger number of loci have at least a small effect on autism risk. An obvious confound is that older fathers may tend to be geekier than younger fathers, thereby correlating paternal age and autism risk independent of age-related sperm mutation rate. NYTimes: Older men are more likely than young ones to father a child who develops autism or schizophrenia, because of random mutations that become more numerous with advancing paternal age, scientists reported on Wednesday, in the first study to quantify the effect as it builds each year. The age of mothers had no bearing on the risk for these disorders, the study found. ... The new investigation, led by the Icelandic firm deCODE Genetics, analyzed genetic material taken from blood samples of 78 parent-child trios, focusing on families in which parents with no signs of a mental disorder gave birth to a child who developed autism or schizophrenia. This approach allows scientists to isolate brand-new mutations in the genes of the child that were not present in the parents. Note Added: After reading the Nature paper more carefully I find the Times article take on the results hard to justify. Yes, de novo mutation rate is significantly higher in sperm from older men. However, a consequent large increase in autism risk is not (as far as I can tell) strongly supported by the results in the paper. It might be true, but I don't regard the evidence as very strong yet. 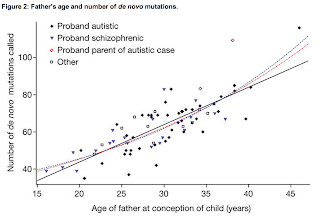 2) We already have a few hits on denovo mutations adding to autism risk. 3) The Icelanders do specify “focusing on families in which parents with no signs of a mental disorder gave birth to a child who developed autism or schizophrenia." 4) The “and Schizophrenia” part seems less confounded by the choice of older paternity. Geeks/borderline autist males probably delay kids, but do sensitive/borderline schizo males as well? "Pooling the results of the three studies revealed three genes to be peppered by these de novo mutations." So, de novo mutations don't hit randomly, and some sites are much more likely than others to be de-novoed. What if one such site happens to be one of the above genes, and happens to be important for autism and/or schizophrenia? I'm mainly just devils-advocating, though, :-) IMO, it's likely that a ridiculous number of brain-dev loci are vulnerable to autismifying denovo. I wonder about the robustness of the finding regarding the mother's age. There are only 78 cases in the study; mothers' ages top out in the early forties; wide spousal age spreads nearly always feature older fathers and younger mothers. So this study's failure to falsify age-of-mother effects may not mean as much as the headline suggests. Another possible confound is the link between father's age and house hold income, and in turn the level of psychiatric care and the diagnosis rate. What I want to know is why do geeky guys produce more autistic kids when geeks largely come from the high end of the IQ scale and autistics largely come from the low end. Obvious only to a moron. The increase in diagnoses of autism does not reflect any real change. There is not a real continuum between genuine autism and normal or schizo and normal. Speaking of such a continuum does bring it into existence.